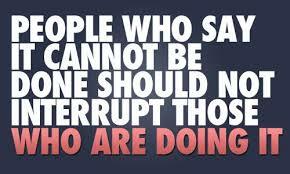 “People who say it cannot be done should not interrupt those who are doing it”. Always listen to whatever they have to say… You’ll always learn something but don’t let them keep you from trying to persue your dreams. As said at F1: “Keep pushing”. The only way to make your dreams come true is trying to make them come true!